The other night I had a pile of boneless-skinless chicken thighs on death row, so I thought I'd use them as an opportunity to work up a new recipe. 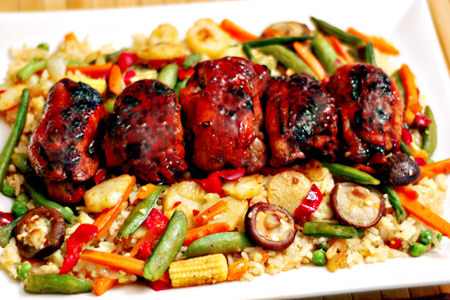 It's nothing really fancy, just some Asian-marinated thighs grilled on skewers that I served over some fried rice and stir-fried veggies. Combine all of the marinade ingredients in a large zip-top bag, seal and shake gently to combine. Add the chicken thighs to the bag, seal (removing the excess air) and squish the chicken around to ensure even coverage. Put the bag in a bowl or baking dish and refrigerate for four hours. Combine all of the glaze ingredients in a small sauce pan. Bring the glaze just to a boil over medium heat. 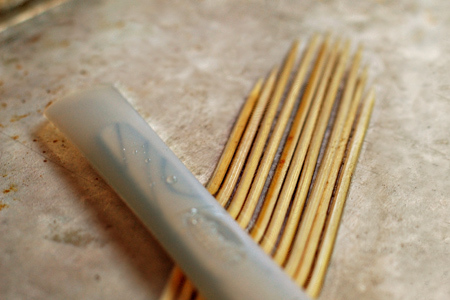 If you plan to use bamboo skewers, soak them submerged in water for at least an hour. Prepare your grill for indirect cooking at medium-high heat (about 375*). 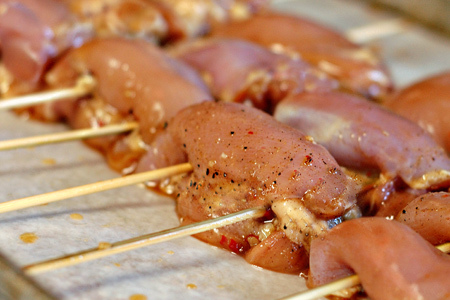 Slide three chicken thighs onto a pair of parallel skewers (about an inch apart). Repeat with the remaining thighs. Grill the chicken over direct heat for about two minutes, or until they are seared nicely. Flip the skewers over and sear the other side. Move the skewers to the indirect side of the grill and cook them until the internal temperature is 165* (about 10-15 minutes). Brush both sides of the chicken with the glaze and quickly move them over the direct heat for a minute or so. You just want the glaze to get sticky and lightly browned. Flip the skewers over and cook another minute. 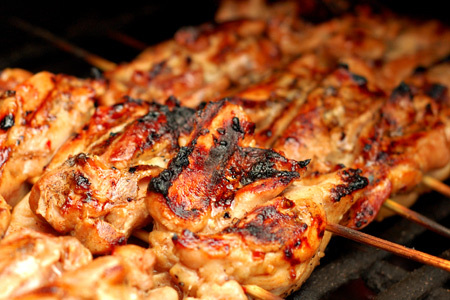 Remove the skewers from the grill, coat them again with the glaze. This looks great! I LOVE chicken on a stick! I made these for Mother's Day with white rice and grilled asparagus - absolutely FABULOUS! Great dish you put together. I love the glaze. I made something similar not long ago using red plum jelly, Mr Yoshida's sauce, sriracha, and some spices. Looks amazing! Ok, so what did you use for the stir-fry? It looks fab as well. I'm Asian-food challenged but my husband loves it so I need all the direction I can get. CRQueen - The stir-fry is just standard Costco frozen stir-fry veggies (big ol' bag, of course) and some simple fried rice. Holy cow, these look fabulous! My husband and I have been trying to make something like this and can never get it right. I'm so excited to try these and EVERYTHING else on your website, too!